A customer recently presented EB Industries with a very unique and challenging welding requirement. They were looking to join a very small EDM cut arm to a 0.050” stainless steel pin. The parts were to be used in a nuclear application so quality and longevity were of primary concern. Welding was the only feasible joining method given the requirements. The challenge was how to weld the joint such that the EDM cut arm was not deformed or cracked by the weld. Electron beam welding (EBW) was the clear choice of a welding technology but a trick was still required to get the correct penetration and weld profile. As the cross section photograph above shows, the results obtained were amazing. The two best options for a welding process were pared down to laser and electron beam welding. Laser was considered first since it does not require that parts be welded in a vacuum, but the process was ruled out because of the shape of the resultant weld. A laser focuses energy on the surface of the part, penetrating deeper and deeper as time elapses. Although the time required to penetrate the part to the required depth was only milliseconds, in that time the energy dissipated out of the top of the weld causing a triangular profile, which would have deformed the EDM cut arm. Therefore, EBW was really the only feasible option. EBW’s distinct advantage over other welding processes is that it produces very deep welds with a very narrow weld profile. There is, however, a significant technical challenge with the EBW technology that had to be overcome for the pin weld. The beam of electrons that is formed by an EBW machine takes time to “ramp up” to the required power level for proper penetration. It also takes time to “ramp down” the power. Although the ramping up and down time is only milliseconds, the energy goes into the top of the joint again causing a triangular profile. To overcome the triangular profile, EB Industries used a copper heat sink to hold the part, as well as provide a shutter for the beam. The heat sink was made from a solid piece of copper thicker than the piece being welded. A small “shutter” hole was drilled in the copper over the area where the pin weld was required. The electron beam was started and ramped up to full power over the solid copper portion. Since the copper easily conducts heat, and because the beam was slightly out of focus, the applied beam did not melt the copper. The part and heat sink were then moved such that the electron beam shot through the shutter hole for a few seconds. The beam was then ramped down on the copper on the other side of the hole. For the short time the beam was passing through the shutter hole, it was focused perfectly on the joint at the correct power level. We performed two weld passes, one on each side of the part. 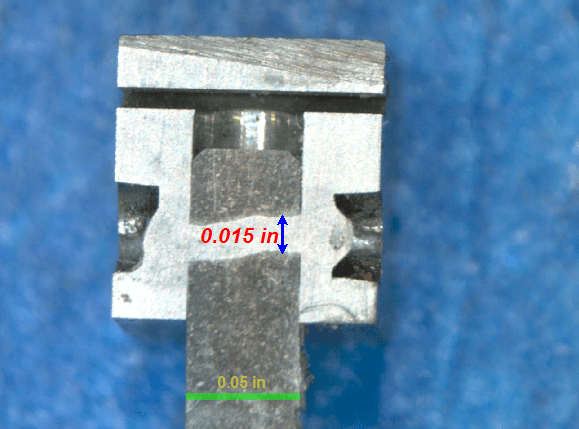 The resultant weld had full penetration with width of approximately 0.015”. Thus, all of the design requirements were met.